From this angle, his body looks a little lobster-like, doesn’t it? 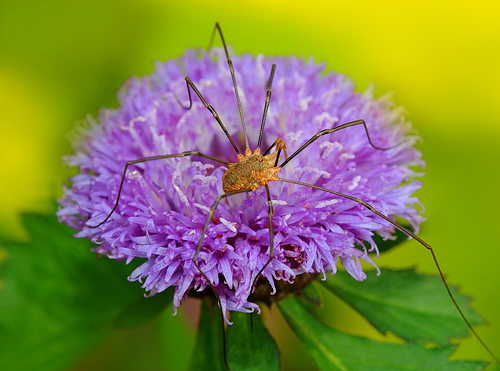 Harvestmen (Phalangium opilio), also known as daddy-long-legs, resemble spiders but they only two eyes and their bodies are in just one segment. They also do not spin threads or build webs and cannot produce venom. I think this particular specimen could be a “Red Harvestman,” because of its orange-reddish brown coloring and dark legs. At Green Spring Gardens this afternoon, my eyes were first drawn to these bright purple petals against the chartreuse-colored sweet potato vine leaves in the background. 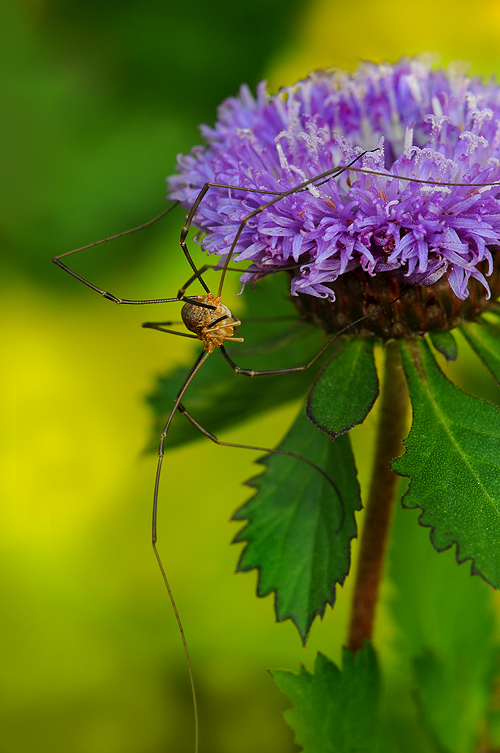 After I got the tripod set up to get my first shots, I saw a stick poking out the right side of the flower. It turns out it wasn’t a stick—it was an appendage. The critter eventually made his way around the front of the flower (See there? Sometime wishing really hard does make it so!) and I pursued him like the horticultural paparazzi that I am. 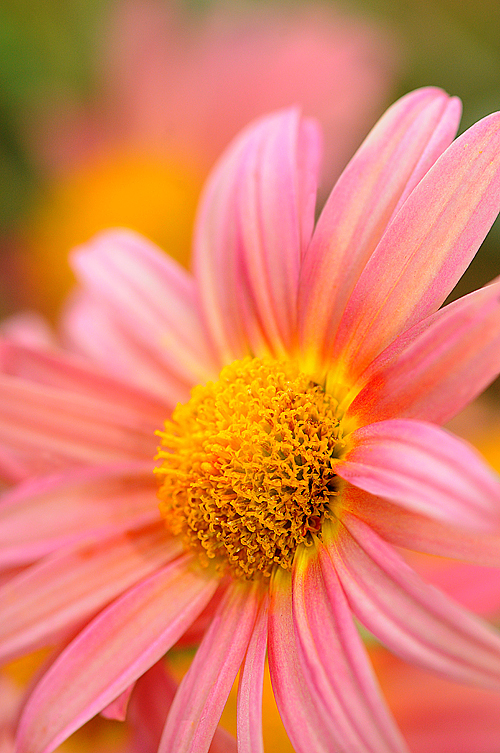 I’m not sure what the flower is—perhaps some kind of Aster? I’ll do some research and update this post later. 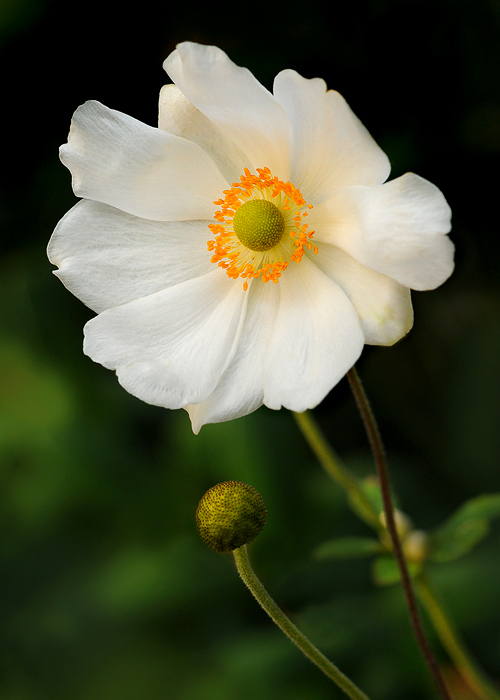 …otherwise known as a “Japanese anemone.” The common name for this plant is “windflower,” and if you have ever tried to photograph this plant when there is a breeze, you’ll find windflower an appropriate name! Another common name is thimbleweed. Anemone x hybrida ‘Honorine Jobert’ (Japanese Anemone) photographed at Green Spring Gardens. This old garden hybrid was discovered in Messier Jobert’s garden in Verdun, France in 1858. Jobert propagated it and named it for his daughter, Honorine. The name “anemone” comes from Greek mythology—Anemone was the “daughter of the wind.” And boy, was it ever windy at Green Spring Gardens when I photographed this flower—I got four in-focus shots out of about 25 total before I conceded to the wind. Gotta love the challenge, though! Herbaceous perennial Sinonome Toad Lily (Tricyrtis x ‘Sinonome’), photographed at Green Spring Gardens. A very old cultivar grown as a cut flower in Japan, this exotic perennial blooms in late summer/early fall and prefers moist to wet well-drained soil in partial to full shade. It grows 2-3 feet tall, spreads 12-18 inches and is hardy in Zone 5-8.